In this chapter, you will learn more about organic, regional and seasonal food and why a meat reduced diet has benefits for the environment. Farmers do distinguish between “organic agriculture methods” and the so called “conventional farm methods”. Organic farming methods use virtually no artificial pesticides or fertilizers and are therefore better for wildlife and habitats than conventional farming. By rotating crops and using compost, leys and manure as natural fertilizers, organic farming helps to conserve soil and water and requires a lower input of fossil fuel energy, which creates a more efficient production system. Organic farming also prohibits the use of genetically modified organisms (GMOs). The production methods and criteria for qualifying as organic are legally defined in the EU, so that all products labelled as organic meet a minimum standard. In very general terms, food produced near to where it is bought and consumed is likely to have a lower environmental impact - particularly in terms of its carbon footprint - than food produced further away. A product’s carbon footprint reflects the amount of greenhouse gases that are emitted during its life-cycle, which includes its production, processing, storage, distribution, consumption and disposal. Products with a lower footprint make a smaller contribution to climate change and are therefore more sustainable. But while locally produced food is likely to be more sustainable, it is not always the case. For example, vegetables produced in a heated greenhouse locally out of season may in fact have a higher carbon footprint than those produced naturally in hotter parts of the world and then transported, so it is worth thinking about the balance of different factors affecting a product’s carbon footprint before deciding what to buy. 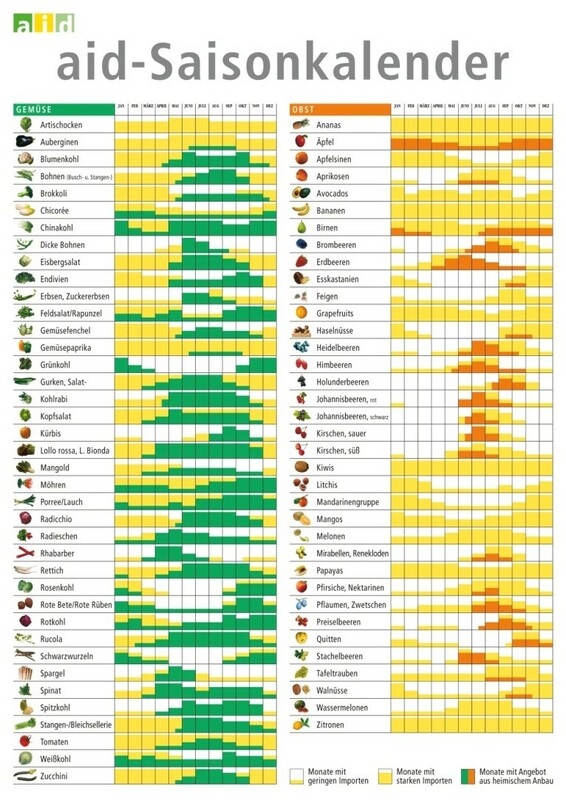 With the help of a seasonal calendar you can see what fruit or vegetable is in season. Buying in season out of the region – from an economic point of view - helps the farmers in your region to generate their income but at the same time it helps as well to keep costs down. Meat production and cereal production are in competition for the world’s limited agricultural land and cereal production for livestock feed is in competition with cereal for human consumption. With 7kg of cereals needed to produce 1kg of beef and 4kg of cereals needed to produce 1kg of pork, our increasingly meat-based diets are not only negatively affecting our health but putting huge pressure on fragile ecosystems. With the rapid rise in meat consumption set to continue, farmers have only two responses: farm their existing land even more intensively - by adding ever increasing amounts of fertilizer and pesticide - or replace forests and savannahs with more farmland. As well as being the primary cause of biodiversity loss, as has been so clearly illustrated by the experiences of Brazil and Indonesia in recent years, both these responses are leading to irreversible depletion and degradation of soils and fresh/groundwater resources, which further limits future generations’ ability to produce sufficient food. While customers have become used to eating more and more meat, there are lots of ways to reduce the amount of meat in menus while maintaining quality and flavor. As well as using meat substitutes, many kindergarten kitchens are also introducing meat free options. With the high cost of meat ingredients and the huge health and environmental benefits of lower meat consumption, reducing the amount of meat in their menus is possibly the most cost-effective way for a kindergarten kitchen to improve the health of the children and the planet. Since in early years eating habits are developed it makes sense to teach the children and the families that meat reduced and vegetarian dishes are tasty and trendy at the same time.